The Cerec crown or more formally the "Computer-assisted design-Computer-assisted manufacture" crown, or "CAD-CAM" is milled by a computer to fit your tooth precisely, thus eliminating the laboratory step in manufacturing a crown. With Cerec's CAD-CAM technology, the crown is made by a computer while you wait, usually eliminating the second appointment and the temporary crown. These Cerec crowns are milled out of pure ceramic. Cerec technology can also be used to manufacture porcelain fillings, inlays, onlays and porcelain veneers. Cerec crowns are milled out of a single block of porcelain and with the assistance of custom staining and oven techniques create beautiful life-like porcelain restorations. Cerec crowns are usually made in one visit, saving considerable time. 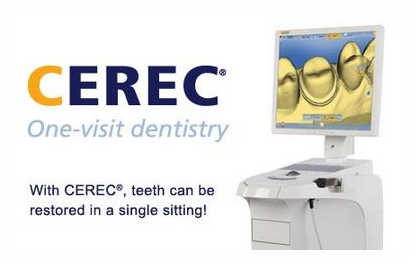 Cerec crowns have no metal in them, creating the look and feel of a lifelike tooth.